The NFL Draft has become a game of numbers. With more intervals and statistics than ever, it creates an overload of information when trying to judge these college players. Heck, it’s come to the point where we are asking ridiculous questions about every asset of a player’s life. Before we know it a players draft stock could plummet just because he had a cough at the combine. However, one stat that constantly gets overlooked is the most important one, winning. In a sea of statistics bombarding every draft analyst ranging from bench presses, to forty yard dashes, and even mental tests, we forget that at the end of the day isn’t it all about winning? If it was all about the stats shouldn’t MIT professors be judging these players rather than NFL scouts? How is it that the winningest quarterback in the Draft class is not being taken seriously? 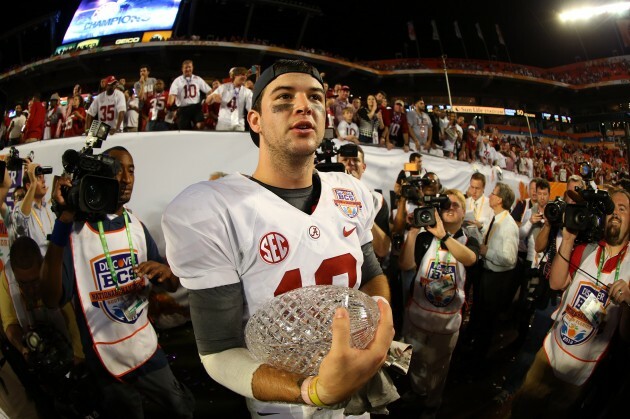 Lost in the three-horse quarterback race of Bortles, Manziel, and Bridgewater, most people have written off Alabama’s Aj Mccarron as a franchise quarterback. On pretty much every website, TV program, and draft special I have researched Mccarron isn’t even considered in the top 5 of this quarterback draft class. Blasphemous I say! If he falls to a team in the second round, he could be the steal of the 2014 Draft. Imagine if the Texans not only draft Jadeveon Clowney with the first pick but also get a great quarterback like Mccarron in the top of round 2. Houston could be back in the playoffs if they were able to pull that off. Why is Mccarron getting overlooked? He’s won two national championships as a starter and had the best record of any starter throughout his duration in college. In his career he has thrown for 77 touchdowns, 15 interceptions, and thrown over 9,000 yards. Despite this, he still has little to no respect. Heck people know him more for his girlfriend, Katherine Webb, then his football career. People will say it’s because of the talent around him that made Mccarron successful, which is true that he had the most talented team in college. However, he also had to live with the highest expectations in college football. Did any other quarterback have that much pressure? Despite a 11-2 record in his senior year, a season which most programs would die for, was a complete failure by Alabama standards. If anything being able to perform under that pressure and unreasonable expectations should make NFL executives want him even more. When studying Mccarron I compare his college career to that of a future Hall of Famer, Tom Brady. Now by no stretch of the imagination am I saying that Mccarron will be the next Tom Brady or a Hall of Famer, but both were in similar situations when drafted. Both were vastly underrated prospects, Brady was the seventh quarterback selected and Mccarron sits as the sixth or seventh quarterback on most draft boards. Brady and Mccarron were considered game managers with little room for improvement. However, the one thing both of them did in their college career was win. 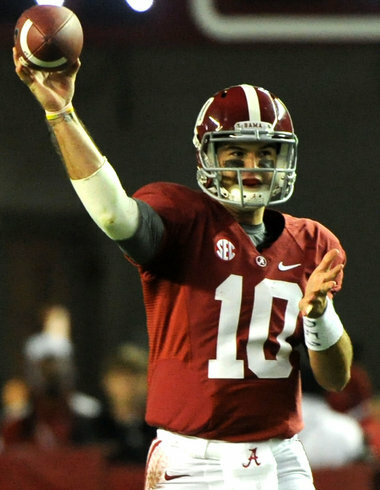 If put in the right system, Mccarron could be a day 1 starter and could be a solid starter in this league. Who knows? In time he could become one of the top starters in the league. Maybe ten years from now we will look back at this draft and say man, how did all of those quarterbacks go before Mccarron? He may not be the most gifted quarterback in the 2014 NFL Draft, but the one thing that AJ Mccarron has proven is he is a winner. And isn’t winning everything? Next Michael Vick From Eight to Great?